As Featured on the New BA Series Ford Falcon ! QUOTE: BA Falcon Instruments - Lighting the way The instrument panel and Interior Command Centre lighting on the New BA model Falcon's utilise the latest technology LEDs; green for entry level vehicles, blue for XR and white for Fairmont and Fairmont Ghia. Similarly, the LCD readouts have green illumination on entry level vehicles and white for XR and high series. Well Folks, You have seen it First Here at the Ford Falcon Modifications Website ! Please Note : If choosing a Blue or Green Colour Instrument Cluster on a EL/NL/DL Model Falcon, the Needles on the Instrument Cluster will not Illuminate Brightly ! This is due to these Needles having an Orange Filter Backing on them, and as such, they Filter out most of the Blue and Green Light created by the LED ! This means that at night time, the Needles may / will not be visible. There are two possible solutions for EL Falcon/Fairmont owners. 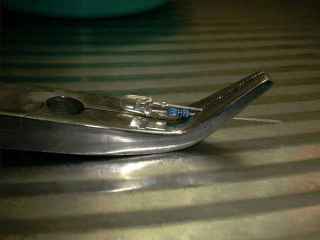 1) Use Cluster Needles from an EF/NF/DF Falcon/Fairlane/LTD. 2) Use Red, Orange or Yellow LEDs for the Instrument Cluster. 3) Remove the Orange Backing on EL cluster needles, by carefully scraping at the back of the needle. This will make the needle completely clear, allowing you to use white paint, or liquid paper and the back of the needle, to change its colour to white. a) If your dashboard lights up a milky white colour, then the chances are that this modification is suitable. 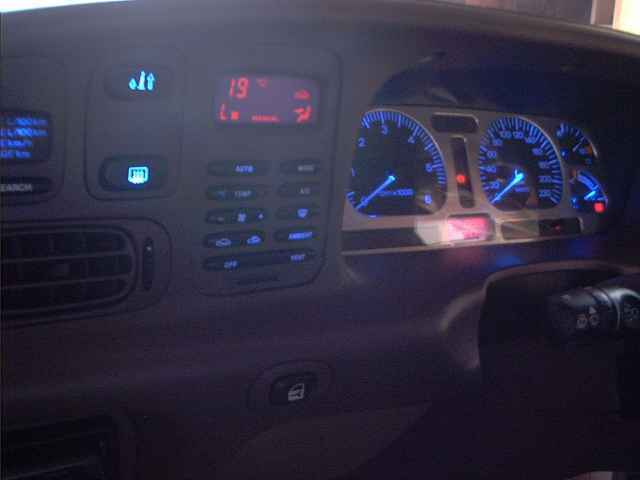 b) If your dashboard uses coloured bulbs, then this modification could be suitable. c) If your dash uses coloured lettering, or a colour filter, then only some colours may be suitable. Please note : Falcons, Fairmonts, Fairlanes, LTD, XR6, XR8, and Utilities manufactured from 1994 to 1996, are all suitable for this modification. (EF, NF, DF, models). 2) Determine the Number of LED's Required. For EF/EL, DF/DL, NF/NL Models, count the following options, and add the number of Leds Required. 6 All Instrument panels, (Low, Mid, High Series). Purchase the required LED's, Resistors, Heat shrink tubing, and Bulb Holders (Bulb holders are Optional). Note for each Led Required, you will need about 5cm of heat shrink tubing, a 560 Ohm (Green Blue Black Black 1%) resistor, and depending on the device, one bulb holder. Oatley Electronics ? www.OatleyElectronics.com.au have Deals on High Brightness LED's. Other models are available, and it is probably best that you check out their website for more information on current models, and prices ! Finally the Resistor Values Quoted herein for the White/Blue, and the Red/Green LED's are suitable for the Oatley Electronics LED's ! Pliers - (For removing bulb holders). 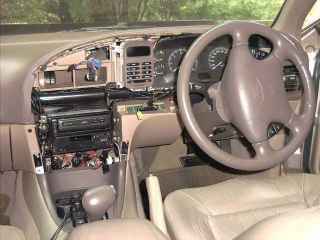 To get access to the Instrument Panel, Climate Control, Clock/Trip Computer, you will need to dismantle the dashboard to get access to these components. 13) Remove the Main Panel. See figure 2. 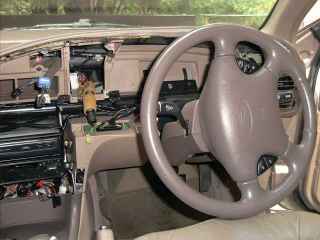 14) Remove the Climate Control / Heater Assembly. (4 Screws, 2 electrical connectors, Vacuum lines, and Temperature rod. This device requires 6 LED's. 1) Cut the longer leg of the LED about 5mm from the top of the LED. 5) Cut approximately 4cm of heat shrink tubing, and apply to the Resistor Leg of the LED. 7) Solder the ends of 3 LED'S together, connecting the Resistor Legs, and non Resistor Legs. Creating 2 pairs of 3 LEDS. 8) Insert the 2 legs in to the white bulb holders, and test the LED assembly. If the LED's do not light, then swap the Legs and try again. 9) If the LED's light, then solder the Legs in to place. 2) Cut one side of a resistor approximately 5mm from the resistor. 3) Solder the Cut Leg of the Resistor to the Cut Leg of the LED. Use pliers, or a paper clip to hold the LED and Resistor together whilst completing this step. 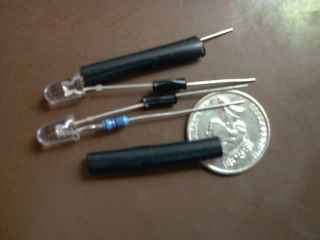 5) Bend the legs of the resistor upward, so as the legs can be soldered to the Bulb holder tabs, near the LED. 6) Press the LED inside the Bulb holder, so as the Resistor sits inside the Bulb Holder, and the LED sits flush with the Bulb Holder. 7) Examine the LED, looking for the Cup side of the LED. Mark the Bulb Holder with a black marker on the Cup side of the LED. (The Cup side of the LED must be connected to ground, or the Negative side of power). 8) Complete the above procedure for 5 more LED's. 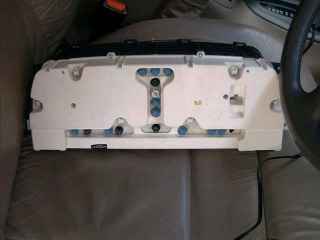 9) Replace the Existing 6 Bulb holders on the Instrument Panel with the newly created LED Bulb holders. (These are the white Bulb holders in the figure). Align the Black mark on the Bulb holders with the following positions. 2 Bulb Holders near top of Instrument Panel, Black marker pointing upwards. 2 Bulb holders at left and right extremes of Dash, Facing outwards. 2 Bulb holders near Bottom of Instrument Panel, Black Marker pointing upwards. This device requires 1 Led, 1 Resistors, 2cm of Heat shrink tubing, and 1 Bulb holder it is very similar to the Instrument Panel, specified above. 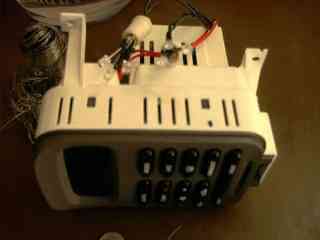 8) Replace the Existing Bulb holder with the newly created LED Bulb holder. Align the Black mark on the Bulb holder so as the black mark is facing towards the outside of the Clock / Trip computer. 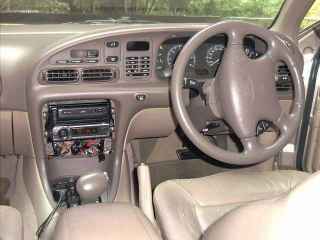 Modification Suitability Suitability is dependent on how your dash produces its current hue. All Dashes lit using white light pass this critical test - dashes using other Colours will depend on how the colour is produced. If your dash uses coloured globes then this modification could be suitable - ones using coloured filters built into the dash are more difficult to convert and modifications may be restricted to a brighter shade of the current colour. If a filter is used, then the shade can actually be changed slightly. (I.E. the Odometer, the Clock readout, and Climate control Temperature readout). Orange can be changed to Yellow, or A Dark Red, using a Yellow or Red LED. Modifications for Ford Falcon AU onwards PLEASE NOTE : This modification will work on AU Model Falcons, However the red Needle colour limits the Needles illumination I Have actually seen an AU series 2 Instrument Panel and I am not 100% sure of the difference between AU and AU2, but I think the main difference was the Odometer colour, with the AU2 being white. resulting in the Instrument Panel lighting up milky White. To be honest though, I am not sure if it is 100% suitable for other parts of the dash. (I.E. shift lever Position, cigarette lighter, etc. ), as the instrument panel was at a auto wrecker, and the rest of the dash was not available for viewing. As you can see, LEDs have a much lower power requirement, meaning they place less stress on the cars electrical system. They are also much more efficient in converting electrical energy to light than a light bulb. Also because of the low wattage, there is no noticeable change in temperature with the resistor. 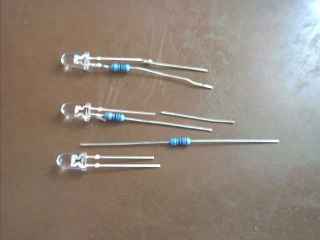 I is the Resistor Supply Current in Milliamps. V = 15Volts (I chose 15 just in case the Vehicles Voltage Regulator dies). 10% x 15V = 16.5V. Well within our required Limits. (Blowing a few LED's would be the least of our worries if the cars Voltage was this high !!! Basically, the lower the resistor value, the brighter the LED will become, but the margin for poor voltage regulation becomes less. What is the Cathode, or Cup side of the LED? The cup side of the LED is the Cathode side. 1) Visibly Looking at inside the LED. There is a Cup connected to one Leg, and on the other Leg, a small wire that leads into the Cup. The Cup is the Negative side. 2) Looking for the Notch on the LED. The LED should be round, but normally next to one of the Legs, the plastic edge of the LED is visibly flattened. This is the Cathode side of the LED. (Positive power). 3) Finally the Longer Leg of the LED is the Anode (Positive) side of the LED.